The Security Council today extended the mandate of the United Nations panel of experts monitoring compliance with sanctions related to the conflict in Somalia for another year as it also agreed to expand the group’s mandate to better enforce the sanctions. In a resolution adopted unanimously, the Council asked Secretary-General Ban Ki-moon to re-establish the eight-member Monitoring Group on Eritrea and Somalia for a period of 12 months starting today. The panel, which monitors compliance with the embargoes on the delivery of weapons and military equipment to Somalia and Eritrea, is now also tasked with investigating any seaport operations in Somalia that could generate revenue for the Islamist militant group known as Al-Shabaab that controls some Somali territory. More broadly, the Monitoring Group must investigate all activities – including in the financial and maritime sectors – which generate revenue that is then used to break the Somalia and Eritrea arms embargoes. It is also required to examine “any means of transport, routes, seaports, airports and other facilities used in connection with violations” of the embargoes. The resolution calls on the Monitoring Group to compile a draft list of individuals and entities that engage in activities inside and outside Eritrea relating to the embargoes that could warrant further measures by the Security Council. It is also tasked with devising ways to boost overall compliance with the embargoes and to identify areas where the capacities of countries in the region can be strengthened so as to fully implement the embargoes. 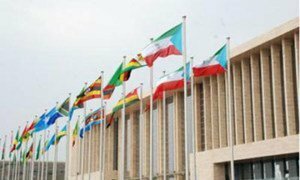 The resolution was adopted a day after the Monitoring Group issued a report which found that the Eritrean Government planned a massive attack on an African Union summit being held in Addis Ababa, the capital of neighbouring Ethiopia.